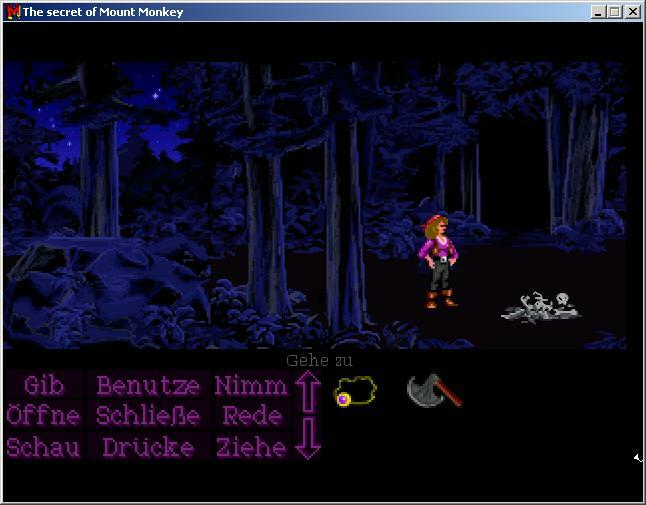 The story takes place about 40 years after the events on Monkey Island. Simon the Sorcerer, the magician who is in retirement now, discovers an upcoming dangerous thing in the sky which will be a danger for the earth. He is looking for Lorraine Threepwood the daughter of Guybrush Threepwood. She has to help him to avoid the the mysterious thing in the sky. Lorraine has to get some different things for Simons magic drink. During her voyage, she is getting to MÃªleÃ© Island (MONKEY ISLAND). Meanwhile her father is the owner of a grog-bar and he is relaxing from his past pirate-life. She meets old friends in the MANIAC MANSION, her old lover INDIANA JONES, visits the world of ZakMcKracken, and travels to foreign countries.. Will she save the earth? ?